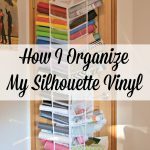 When you have a Silhouette, you are always looking for things that can be vinyled. 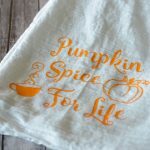 There are so many plain items at places like Target, Amazon, or other stores just waiting for some decoration. 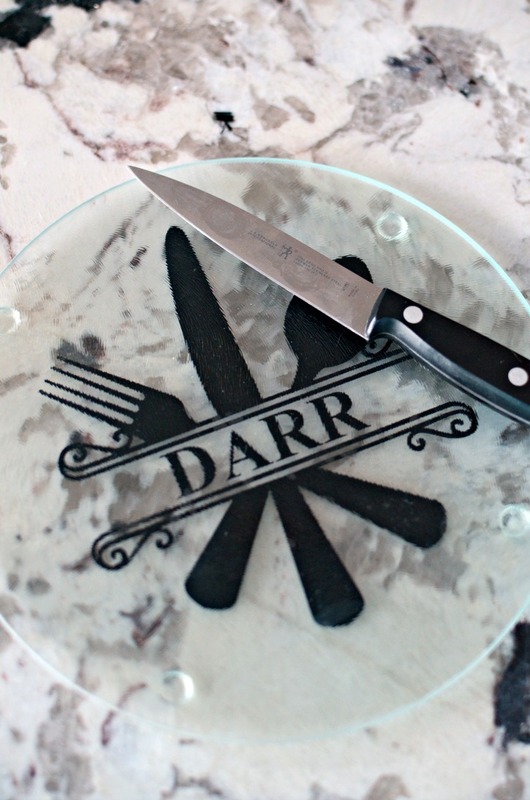 Today’s post uses a plain glass cutting board and turns it into a personalized gift. The cutting boards that I’m using are 7.75″ (square and round) but the idea is the same for all sizes. Starting in Silhouette Design Studio, create your design. I bought the silverware and name one from the Silhouette store, the others were created by me using a mix of fonts. 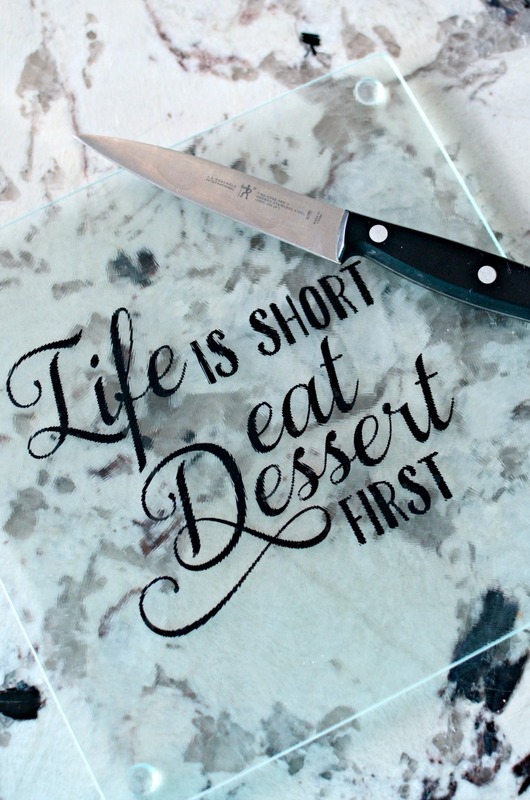 I tried to think of some funny sayings to put on these cutting boards and decided with “Life is short, eat Dessert first” and “Many have eaten here, Few have died”. I thought that they were fitting for the kitchen. The key to these personalized cutting boards is that the adhesive vinyl is solid colored so what is really being seen is the bottom side. Since the vinyl is going on the bottom. It is very important that the design is MIRRORED before you cut. These cutting boards are rough on the top; however, their underside is nice and smooth which is perfect for vinyl application. Once the vinyl has been cut and weeded, use transfer paper to apply the decal onto the underside of the cutting board. Use nice, firm, pressure to make sure there are no bubbles remaining. I love how these turned out. The “Life is short, Eat Dessert First” and “Many have eaten here, few have died” would be fun hostess or housewarming gifts. I could see these becoming staples of wedding and bridal shower gifts with her new last name. What sort of sayings would you put on a cutting board? Oh my goodness! These are just too cute! Almost too cute to cut on! What a lovely gift idea, when I first read cutting vinyl I was wondering how that would work, but as soon as you said “mirror image on the bottom” it all made perfect sense. This is an awesome gift idea! 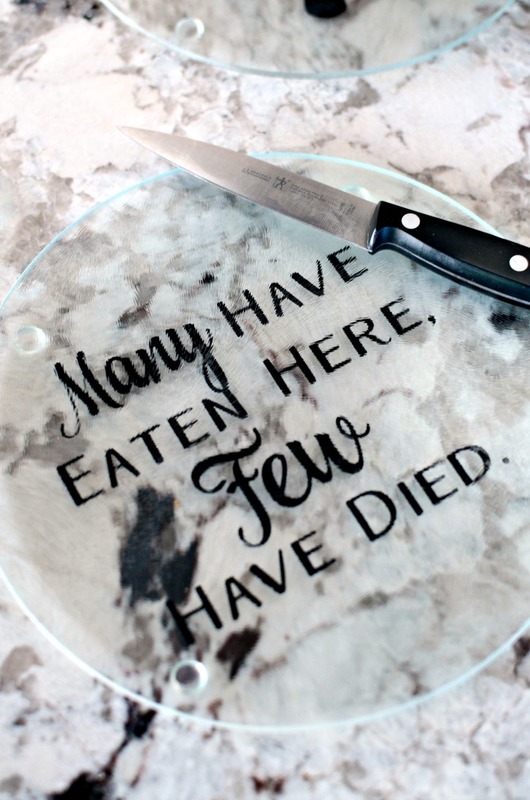 I love the “many have eaten here, few have died” one myself, lol! Are these washable? I haven’t tried washing anything I’ve used vinyl on so I was just curious! These boards are positively darling! I love the idea of dressing them up! Sorry I didn’t get a chance to comment right after you posted to Throwback Thursday last week! Okay, Great gifts for next year! Thank you for sharing! I have pinned! Oh my goodness, I love this idea! 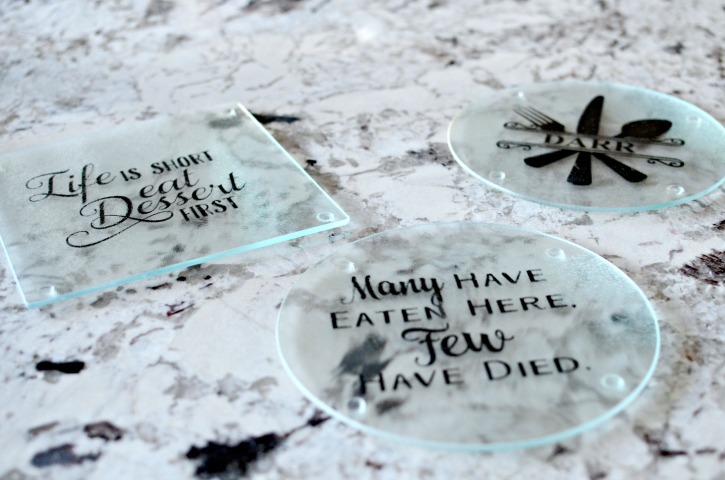 I have a few glass cutting boards in my cupboards and this is such a great way to add some personality to them and not be embarrassed about having them stay on the counter. Pinning to bookmark and share. These are so cute! Love this idea. Thank you for sharing at Merry Monday! Such a cute idea. Thank you for linking with us at #HomeMattersParty . We would love to have you again next week. 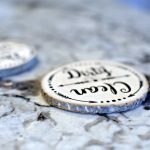 Love this DIY!! This is such a great idea for a gift. Did you just use regular vinyl or is it special one since it will get wet? I don’t have a reply but I would love the answer as well. I was thinking the same thing. I use Oracal 651 and it sticks on just fine. I won’t send it through the dishwasher because the heat + water can have an adverse effect; but hand-washing is just fine. How fun are these? 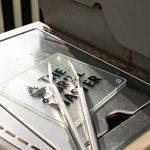 I’ve had a great idea for one for my husband to bring things in and out for the grill and this makes me confident I can make it happen instead of paying for someone else to do it! These would definitely make great gifts for newlyweds!